Russia has begun air strikes against targets in Syria it says are held by Islamic State (ISIS) militants, after Russian President Vladimir Putin received the full backing of parliament to use military force abroad in response to a request from Syrian President Bashar Assad. However, locals are claiming the targets were not in ISIS-held areas. Russia’s air force has launched a series of air strikes on sites in Syria it claims are controlled by the Islamic State (ISIS) radical militant group after the Russian parliament gave its unanimous backing to a request by Russian President Vladimir Putin to use the country’s military in support of Syrian President Bashar Assad. The strikes were carried out against targets in the strategic western province of Homs, though the U.S., which was given an hour’s notice of the attacks by Moscow, said that the sites hit were not in areas held by ISIS. Locals, activists and rebels told Reuters that the areas of Homs province hit by the air strikes are controlled by the Free Syrian Army, a grouping of rebel militias that oppose Assad, though Russia insists that the sites struck were military targets including ISIS weapons depots and communications infrastructure. "Russia has barely managed to launch its operation to counter [ISIS], and already there have been numerous fake reports in the media saying that peaceful civilians are dying as a result of the Russian operation," the Interfax news agency quoted spokeswoman Maria Zakharova as saying. “We have informed the authorities of the United States and other members of the coalition created by the Americans of this and are ready to forge standing channels of communication to ensure the most effective fight against terrorist groups,” said Lavrov. 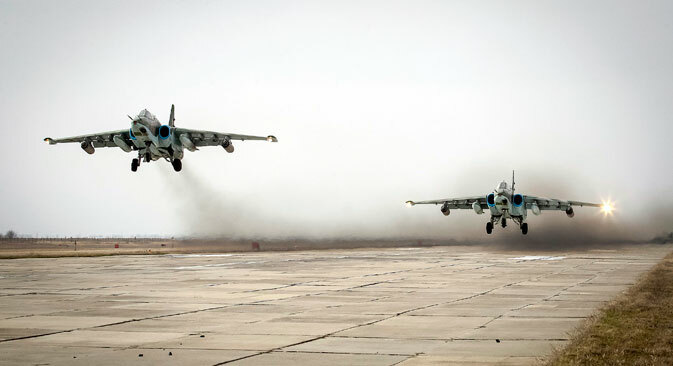 Syria’s government has confirmed that it requested military assistance from Russia. According to a tweet by the rescue organization Syria Civil Defense, which is responsible for co-ordinating around 2,000 volunteer rescue workers in rebel-held areas, 33 civilians were killed in the strikes, including three children and one of its volunteers. Earlier on Sept. 30, Russia’s Federation Council authorized the use of the Russian armed forces abroad in a special closed session called by President Vladimir Putin, who submitted the request to the upper house of parliament following a request by Syrian President Bashar Assad for military assistance. Immediately after the decision was taken, Chief of the Presidential Administration Sergei Ivanov said that the number of Russians joining ISIS [banned in Russia – RBTH] is growing rapidly, “we are talking here not about dozens, nor hundreds, but thousands” of people, and it is advisable to solve this problem in faraway countries. “This decision is justified by Russia’s national interests,” he explained. Ivanov pointed out that this is not the first time that Russia is using its armed forces to combat terrorism abroad: “In the early 1990s, we did almost the same thing in Tajikistan,” he said. “The use of the armed forces on the territory of a third country is allowed, in general, by the resolution of the UN Security Council, or at the request of the legitimate leadership of the that country,” said presidential press secretary Dmitry Peskov, commenting on the approval to use military force. In his statement, Ivanov stressed that all the other countries that are carrying out air strikes on Syrian territory are acting in circumvention of international law. “This is the fundamental difference between our approach and the approach of our Western partners. They do not respect international law, while we observe it,” he said. However, as RBTH was told by Alexei Arbatov, director of the Center of International Security at the Russian Academy of Sciences, the two leaders were discussing ground operations. “This talk did not include air support, or air strikes against the positions of Islamic State,” he said. Military expert and retired colonel Viktor Litovkin agrees with him: “Putin was talking about ground operations. Russia will not participate in these, but it was never said that Russia would refuse to provide air support, intelligence support, and carry out strikes against terrorist bases,” he said. Such an agreement between the leaders of Russia and the United States has actually been confirmed in the U.S. Embassy in the Russian Federation, commenting on the decision of the Federation Council. The two presidents agreed that they share common interests in the fight against terrorism of the Islamic State in that region, they said at the embassy. However, this does not mean that Russia has agreed to enter into an international coalition against ISIS under the auspices of the United States. “Most likely, this will just be tight cooperation between Russia and its allies – Iraq, Iran and Syria. In fact, this will be co-operation between two coalitions,” Ivan Konovalov, director of the Center for Strategic Trend Studies and an expert on international security, told RBTH.